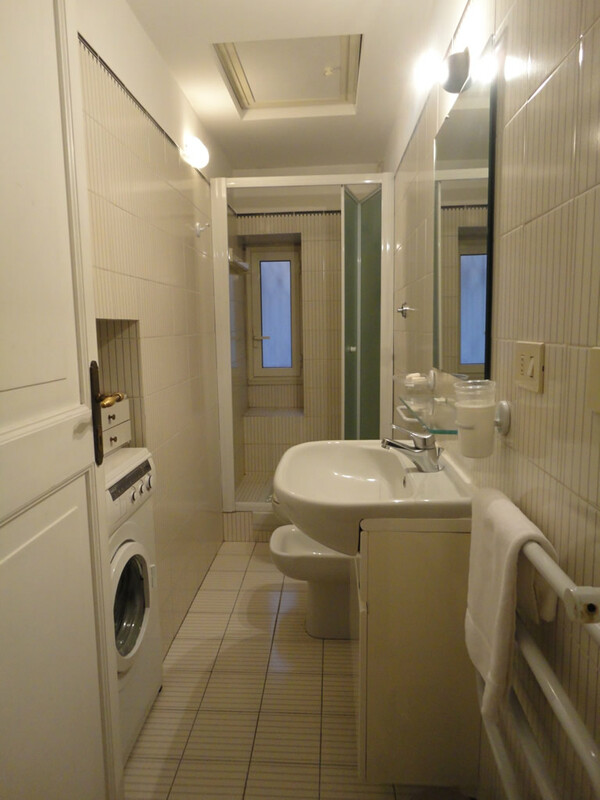 All'Obelisco Apartment is located in Via della Mercede 52, on the third floor of an elegant building of the '700´s, newly renovated and featuring an elevator. Its location is very strategic. We are in the heart of Rome, just 50 meters from the stop of dozens of bus lines, 300 m from Metro Stations (Piazza di Spagna or Piazza Barberini) and 50 m from the taxi station, in Piazza S. Silvestro. 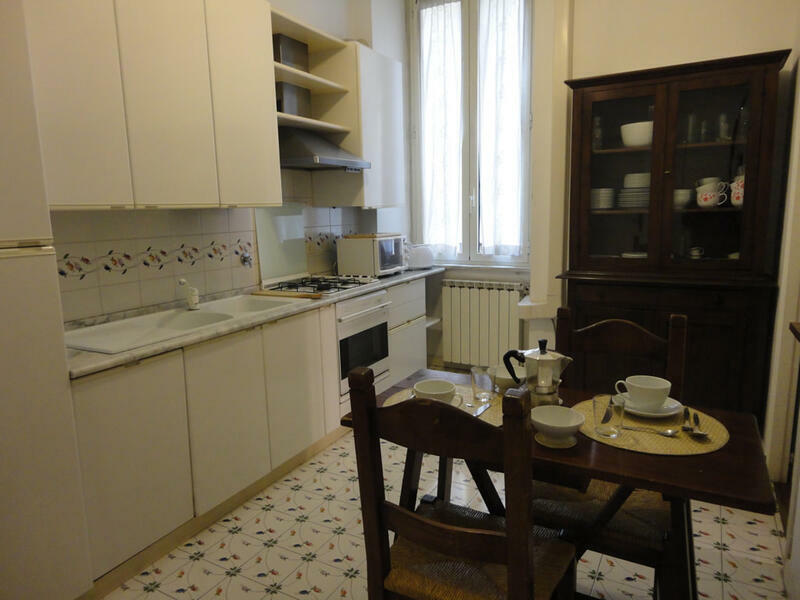 Therefore, it is very easy to reach the apartment also from Termini Station and from the airports of Fiumicino (Leonardo da Vinci) and Ciampino. 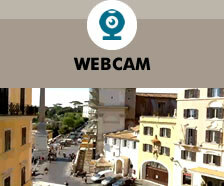 The area is full of typical restaurants and historic cafes where you can enjoy the most typical Italian flavors. The area also offers theaters, cinemas and many events that animate the beautiful squares of Rome, especially in the spring. 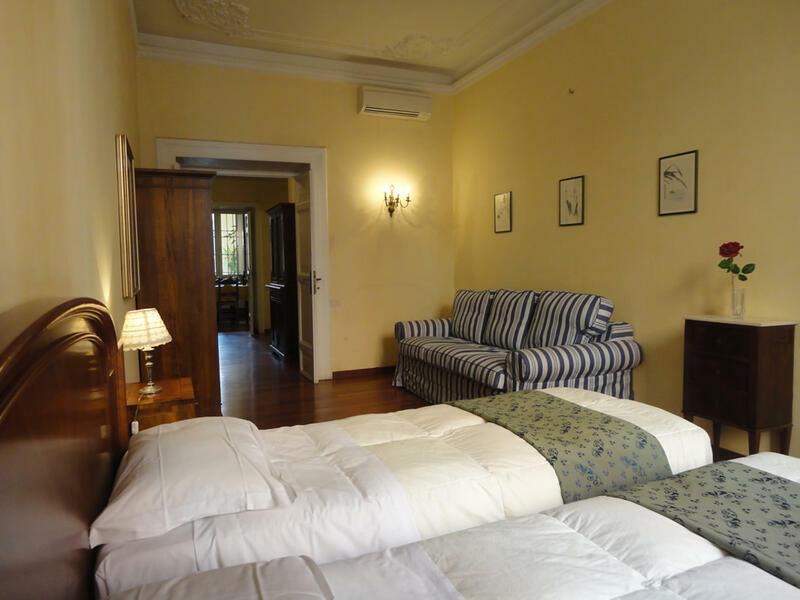 All'Obelisco Apartment is a comfortable and stylish accommodation for those looking for holiday apartments in central Rome. This beautiful 90 square meters apartment is suitable to comfortably accommodate two couples but even a family of 4-8 people. The beautiful hardwood flooring throughout the house makes the atmosphere warm and welcoming. The entrance opens onto a large living room with table and chairs and two sofas, one of which converts into a double sofa bed. In a separate room there is the modern kitchen, fully equipped to prepare any meal in absolute comfort. 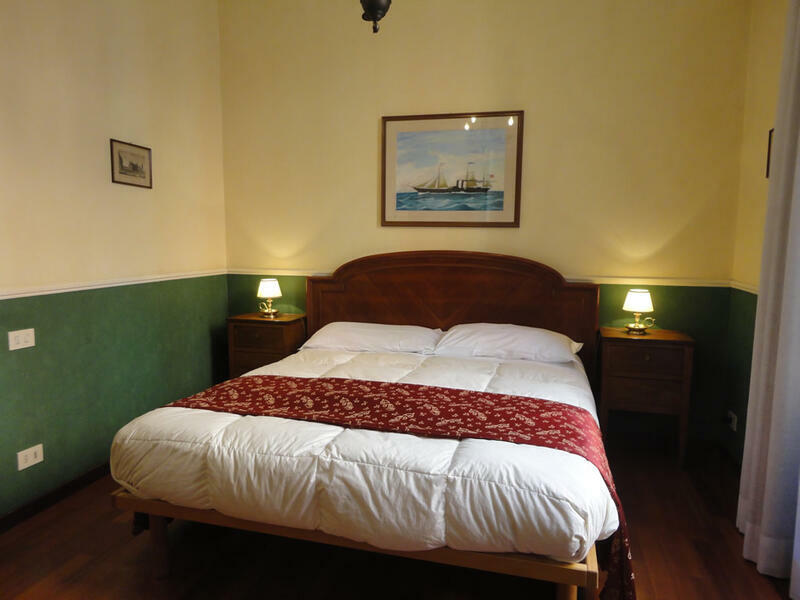 There are two bedrooms; the first bedroom is very spacious and features a double bed (or 2 singles) and a double sofa bed, while the second room has a double bed; both rooms are equipped with private bathroom with a bathtub or shower, both finely finished. 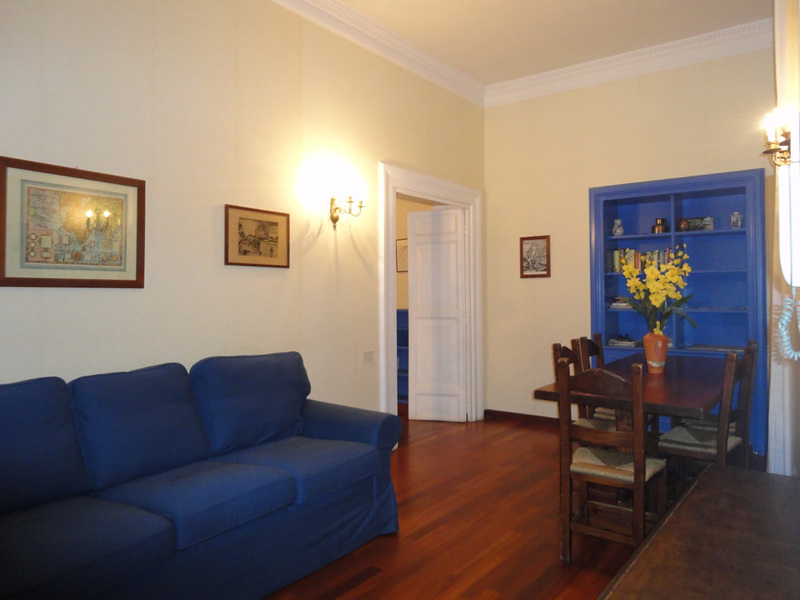 The apartment is equipped with all comforts: heating and air conditioning, 2 TVs 32 "HD, Sky with international channels, ADSL internet connection with wireless signal, PC, dishwasher and washing machine. All'Obelisco Apartment is easily accessible from major access points of the city, including the railway station of Rome Termini and Fuimicino and Ciampino airports, thanks to its proximity to the metro station (300 m - Line A), to the Taxi Station (50 m - Piazza San Silvestro) and to the stop of many bus lines. To do your transfers in comfort, it is also possible to book a car service with driver, which provides services to and from airports, railway stations, Civitavecchia´s Port and other places. The train Leonardo Express departs from the airport to the Termini train station r every half hour (costs about 14 Euros). From Piazza dei Cinquecento to Piazza San Silvestro you can take the bus 75, then walk to via della Mercede 52 only 100 m away. Alternatively, to travel in comfort, we can arrange a transfer service by car at variable charges depending on the number of passengers and luggage (50 to 90 euros). To take a taxi will cost you about 48 euros. The Terravision service connects the airport to the Termini station (timetables on the website www.terravision.eu). The Cotral coaches service from the airport to the Metro A station Anagnin, from which you can then continue your journey by metro line A to Piazza di Spagna, then walk for about 300 m. There is always available the car rental service with driver at variable charges based on the number of passengers and luggage (from 50 to 90 euros). Taking a taxi the fare is about 35 Euros. The bus 75 departs from Piazza dei Cinquecento and stops at Piazza San Silvestro, from there you can walk 100 mts up to via Mercede 52. A car rental service with driver is available at a rate varying from 35 to 50 euro or so, depending on the number of passengers and luggage. Using a standard taxi costs about 10-12 euro. We remind our guests in all apartments and rooms are non-smoking and pets are not allowed. Rooms are interchangeable by an operator, so if the on-line booking system shows no availability for the chosen period, please contact us through the "Contact" link; perhaps we could find you the accommodation requested!